To generate a method trace of your app's execution, you can instrument your app using the Debug class. Instrumenting your app this way gives you more control over exactly when the device starts and stops recording tracing information. The device also saves your trace logs using the names you specify, so you can easily identify each log later. 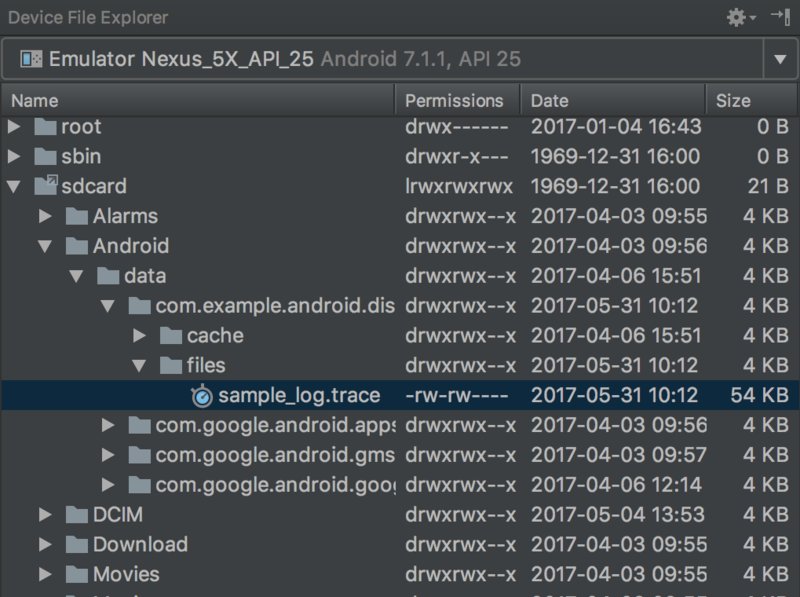 You can then view each trace log using the Android Studio CPU Profiler. You can also start and stop tracing in the CPU Profiler without instrumenting your app's code. Before you start generating trace logs, make sure your app has permission to write to external storage (WRITE_EXTERNAL_STORAGE) so that it can save trace logs to the device. To create trace logs, call startMethodTracing() where you want the system to start logging tracing data. In the call, you can specify the name for the .trace file, and the system saves it to a package-specific directory that's intended for persistent app data on the target device—this is the same directory that is returned by getExternalFilesDir() and is located in the ~/sdcard/ directory on most devices. This file contains the binary method trace data and a mapping table with thread and method names. To stop tracing, call stopMethodTracing(). // device with the name "sample.trace". // the buffered data to the output file. Note that if your app calls the startMethodTracing() again without changing the name of the trace log, it overwrites the existing log saved to the device. To learn how to dynamically change the name of each trace log, go to the section about saving multiple logs. If the system reaches the maximum buffer size before you call stopMethodTracing(), the system stops tracing and sends a notification to the console. The methods that start and stop traces work across your entire app process. That is, you could call startMethodTracing() in your activity's onCreate(Bundle) method, and call stopMethodTracing() in that activity's onDestroy() method. Note that your app runs more slowly when profiling is enabled. That is, you shouldn't use the profiling data to determine absolute timings (such as, "method foo() takes 2.5 seconds to run"). The timing information in the trace logs are useful only when comparing it to previous trace logs, so you can see if recent changes make your app faster or slower. When deploying to devices running Android 5.0 (API level 21) and higher, you can use sample-based profiling to profile with less runtime performance impact. To enable sample profiling, call startMethodTracingSampling() (instead of calling startMethodTracing()) with a specified sampling interval. The system gathers samples periodically until your app calls stopMethodTracing(). // the current date and time. // Applies the date and time to the name of the trace log. Use the Device File Explorer. To open the Device File Explorer, click View > Tool Windows > Device File Explorer (or click the Device File Explorer button in the tool window bar). As shown in figure 1 you can locate the .trace files by navigating to your app's package-specific directory. Figure 1. Locating the trace logs using the Device File Explorer. Copy the file to your local machine using the adb pull command. The command below copies a trace log named sample.trace from the device to the ~/Documents/trace-logs/ directory of your local machine. You can then import the trace file with the CPU Profiler.